People have lost interest in politics as the politics in our country that was a voluntary service has been made a very profitable business. The politics in Sri Lanka today is more profitable than heroin racket. Heroin racket is profitable but dangerous. However, there is no danger in politics. People enthusiastically make it possible for politicians to steal. 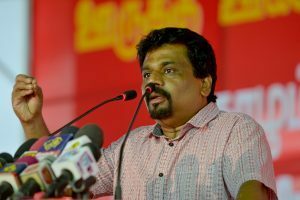 As such, politics has been transformed into a dignified profitable business,” says the Leader of the JVP Anura Dissanayaka speaking at a meeting held at Ulhitiyawa area in Wennappuwa. Speaking at the meeting held to support the JVP candidates contesting the Wennappuwa Pradeshiya Sabha at the local government election Mr. Dissanayaka said, “The main reason for people in Sri Lanka to despise politics is because it has been made a business. The bond scam is one such business that has been committed in the country lately. The working masses in our country suffer all 24 hours of the day to earn a living. Fishermen risk their lives to go to the deep sea to earn a living. However, the bond fraudster s do not confront such risks. The son-in-law earned Rs. 12000 million without much effort. His profits are the size of five brick kilns. The people have to face the consequences of this crime until 2045. A politician from upcountry began his profession as an insurance agent earning Rs. 1,200 monthly in 1990. He enters politics. The so-called patriot now has houses on Kinsey Road, in England, has shops in AirPort. His daughter studies in the USA. See how profitable politics is! Don’t people despise such politics? In 2015 Mr. Maithripala Sirisena is elected as President. He says he would abolish presidency. He said he would go home in 2020. However, after 3 years he gets the ‘taste’ of politics. He asks the Supreme Court whether he could continue as President until 2021. When coming to power he said he would go home in 2020. Now, after three years in office, he asks whether he could be in power for another year. This is power hunger. The ‘yahapalana’ president who said he would go home after five years has been caught up in the political business net. If he was democratic and promotes good governance he need not ask whether he could continue till 2021. This is what Chandrika did and also Rajapaksa did. When we were young when we were asked to draw a picture we drew a man with a mask, tattoos on his body and a pistol or a dagger in his hands. When today’s children as asked to draw a thief they draw a man with a national suit with a shawl or a man wearing a full suit. This is now the future generation looks at politicians of today. Politics has become bitter for people. There are some in villages who say they are traditional UNPers or they have been members of the SLFP for generations. However, their leaders have not stuck with one party. How many times SB, Jonnie, Mangala, Gamini Lokuge, Karu Jayasuriya have crossed from one party to another. However, people in the village have been divided into parties for generations and fight with each other. The political leaders who are elected by the people jump from one side to another for privileges and to engage in political businesses. We ask the people in this country to vote for the JVP to stop the political business. We are prepared to make politics that has been made a business a people friendly service, a voluntary service that works for the people. Hence, we believe people at Wenenappuwa and other areas in the country would rally around the JVP. The JVP leader for Puttalam District Samantha Koralearachchi, Candidates for Wennappuwa Pradeshiya Sabha Anton Kumara and Devon Layantha also spoke. A large crowd was present.